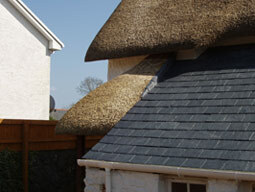 Thatched residential dwelling in Bonvilestone, Vale of Glamorgan, South Wales. 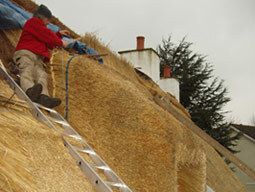 We removed all of the water reed to reveal what was left of the wheat reed and re-thatched the roof with combed wheat straw, returning it to its original splendour. 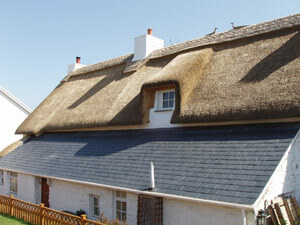 Modern fixings were used to fix the thatch in place as there was insufficient base coat material left to use a traditional sparing method. We replaced the window and frame in the vernacular style and added fixing points to the new window sides using oak boards to kick the straw up. In the left of the picture, you can see the original wheat reed which we left in place, preserving the history of the roof for generations to come and adding additional thermal value to boost up the insulation. 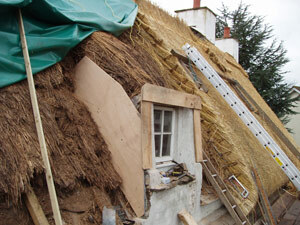 The new thatch was then added over the top. 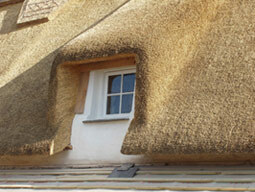 We put in a new window sill and also repaired and slated the lean-to roof.